FreddieSteadyKrc.com - Austin Music Awards Hall-of-Famer Freddie Steady Krc comes by his name honestly. 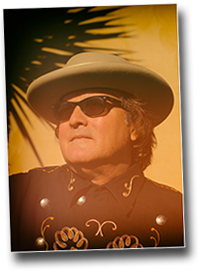 This singer / songwriter / guitarist / drummer / renaissance Texan has plied his musical wares around the world the past few decades. A charismatic live performer, Krc wins over any audience with his captivating original songs and engaging stage presence. He also enjoys capturing the spirit of his favorite cover songs. Krc (rhymes with search) landed in Austin at the moment that a musical revolution was getting started at a styles-don’t-matter joint called the Armadillo. The kid and the town were a perfect match. BRADLEY KOPP Lead guitarist for the Shakin' Apostles and a Producer/Engineer Bradley Kopp has been a fixture in the music scene in Austin, Texas for 20 years. During that tenure he has lent his musical support to a veritable who’s who of singer songwriters and recording artists including Iain Matthews, Charlie Robison, Jimmie Dale Gilmore, Joe Ely, Ian Moore and many, many more. He is equally versed in rock, roots, country, folk and pop styles and has toured extensively in the US, Canada, Europe and Japan. BOB LIVINGSTON / TEXAS MUSIC INTERNATIONAL The cyber home of long-time Jerry Jeff Walker bass player Bob Livingston (or "The Rightful Heir To The Throne of France" as he insists on being called). Bob is doing some wonderful things with the meeting of music from Texas and India. Check it out. THE TEXAS MUSIC OFFICE Straight from the Office of the Governer. Casey Monahan, Director, ensures that the Texas Music Office serves as the information clearinghouse and promotion office for the Texas music industry. If you are looking for information about Texas Music, then start here. PONTY BONE A huge part of the Austin scene the last two decades, accordionist Ponty Bone is, after all, completely unique...just like Texas. To define his style of music in a word is a difficult task, but, describing his mastery of his instrument, the word most often used is "awesome." Playing the accordion all his life has given him chops enough to mix his Texas blues with Louisiana Zydeco and, then mix Mexican or Caribbean rhythms with his own wry originals. 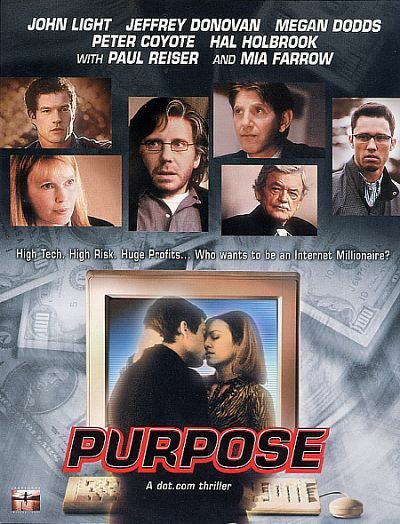 PURPOSE Director Alan Ari Lazar assembled an impressive cast (John Light, Megan Dodds, Peter Coyote, Hal Holbrook, Paul Reiser, Mia Farrow) for this 2002 drama centered around the dotcom boom. He assembled an even more impressive soundtrack when he chose Freddie's "Missing You Tonight" for inclusion. PHANTOM GUITARS Phantom® is the exclusive manufacturer of the Teardrop™, Phantom™, MandoGuitar™. Phantom® Guitarworks brings back the classic abandoned body shapes of a bygone era, the swinging sixties! These totally groovy instruments are based on the much sought after English instruments from the early era of the Rolling Stones and the Beatles. Freddie plays and officially endorses these instruments made from the finest mahogany and alder bodies just like the originals with hard-rock maple necks, and Indian rosewood fingerboards. Freddie's model is the Phantom Teardrop. DENIM Thirty plus years down the road from their roots in the birth of the Great Progressive Country Scare, Denim is still rockin' Texas with their own brand of music. Freddie first recorded with Denim in 1976 and still shares the stage with them several times a year. ROKY ERICKSON This is the "official" web site of Rocky Erickson. There is information about all phases of Roky's career, including the times that Freddie and The Explosives were Roky's band. STEVE FROMHOLZ Character. Guts. Compassion. Originality. Name your compliment. They all fit. Freddie first recorded with Fromholz in 1976 on Steve's "A Rumor in My Own Time." PAMELA RICHARDSON Freddie recently performed with Pamela at a Gene Clark tribute in Chicago. He was so taken with her as a person and a mucician that he wants you all to know about her talent. THE SOUND ENHANCER Freddie is now officially endorsing this product. 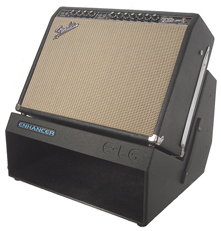 His combo amp sits cradled at a 90 degree angle on the Sound Enhancer. RICHARD DOBSON Texas singer - songwriter - author, and friend of Friddie, living in Switzerland.